About a year ago, I was at Mark and David's house in LA and, even though they have a maid, found myself cleaning like a mad woman. 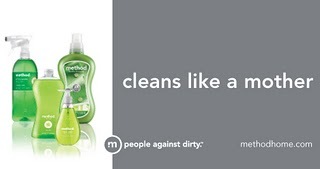 It's not that I like cleaning (in fact, I hate it), but they had all these Method products that smelled really pretty and I don't know... they made cleaning fun. 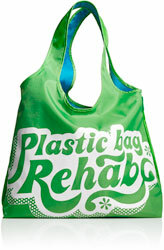 Anyway, to find out how you can get your own "Plastic Bag Rehab" bag like the one above for FREE (and to find out how you can help fight plastic bag waste, which is really the purpose of the bag), visit givegreener.com. If you haven't tried method products, I highly recommend that you do. They smell pretty, look pretty, and work pretty damn well. Yay Method!